Cultures around the world have been including insects as part of their diets for millennia. But in the U.S. – where raising livestock accounts for a staggering percentage of greenhouse gas emissions – eating insects as a source of protein has been slow to catch on. Could that finally be changing? Several companies have begun testing the waters with insect-derived proteins, and are hoping that by blending them into popular foods — smoothies, cookies, oatmeal, and more — health- and eco-conscious shoppers will give them a try. These companies argue that crickets are a nutritious source of protein – comparable to chicken or beef – but with a smaller carbon footprint. They use much less water – one gallon per pound of protein – than other energy sources like beef (2,500 per pound) and almonds (1 gallon per almond). 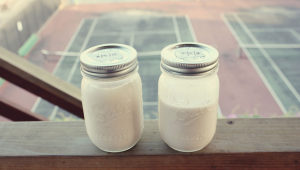 Plus, they can be added to smoothies and baked goods as an easy replacement for whey and other animal products. Are crickets more sustainable than chicken or beef? That depends on what you feed them. According to TIME, “Swapping chickens for crickets–while feeding them the same thing—is unlikely to make a real difference.” Ideally, crickets would be fed a diet of processed food waste so as to maximize the environmental benefits. Another advantage to raising crickets is that the process is more humane than factory farming. Crickets are frozen before they are roasted, which places them into a state of hibernation. Pescetarians and even some vegetarians may consider this to be an ethical means of food production, similar to eating sustainable shellfish. 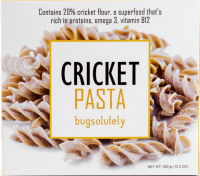 Cricket flour may not be available in your grocery store yet. But if the idea catches on, eco-villages of the future may be just as likely to have a cricket farm on the property as they are to have a bee hive or chicken coop. Crickets aren’t the only new addition Western diets. Earthworms, while not technically insects, are also getting some culinary attention. NPR reports that earthworms are popular among the Ye’kuana people of Venezuela, the Maori of New Zealand, and in some parts of China. Although they reportedly taste … well, earthy, they’re high in protein, iron, and calcium, and can be smoked or boiled. Thailand Unique, which sells a variety of insect products, offers earthworm jerky. While you can harvest earthworms from your own backyard, there is some health risk related to contaminants that may be in the soil. NPR recommends boiling them for 10 minutes, three times, before eating them. But according to the Washington Post, the crystals are “among the most nutritious and highly caloric substances on the planet… [containing] three times more energy than buffalo milk” — one of the most calorically-dense animal milks. While there are no plans yet to produce cockroach milk for human consumption, reseachers say that it could be added to protein shakes, and perhaps be derived from bio-engineered yeast. However it’s developed, it’ll probably be more environmentally friendly than almond milk. Have you tried any insect-based proteins? What do you think of the ethical and environmental implications of eating insects? Post your thoughts in the comments below!